Selection of wall decoration for your child’s room can be quiet daunting especially if you do not have the flair. The fact that you need to foster creativity and the right combination of colors, this definitely makes a major feat for parents. To ease your burden in room decoration, you can get it done with a so-called vinyl wall art. Just what are Wall Decals? The wall decals are stick on decorations that can be applied to walls. It comes in a range of designs and styles to suit the room’s need for a particular style. Examples of these are the wall decals for nursery that aids parents in adding panache to their child’s room. For a fact, designs range from fancy animals, trees, and to animations. Vibrant colors are also used that inevitably complements to the developing eyes of your children. Using vinyl wall art is simple. All you have to do is apply it to a smooth surface and presto, you are done with it. If you want to change it after several months, you can just remove it and apply a new one. In using this wall decal, you should not stick it on rough surfaces because it tends to give negative result. 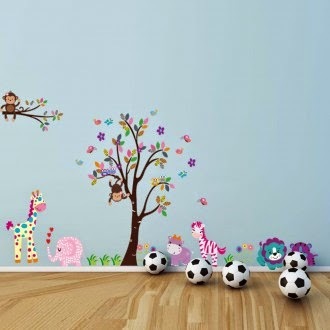 To sum this up, the vinyl wall decal for children are made to ease the burden of parents in room decoration. With this adornment on hand, you can transform a plain-looking wall into a room that is full of character.